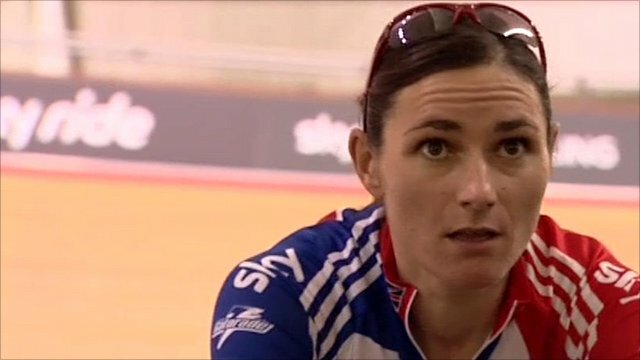 Sarah Storey clinched her second gold at the World Track Para-Cycling Championships in Italy, edging a close 500m time trial final. A successful day for Great Britain also saw Darren Kenny, Jody Cundy and Terry Byrne win team sprint gold. Neil Fachie and Craig MacLean clinched their second title of the Championships in the tandem sprint. Great Britain ended the competition at the top of the medal table with nine golds, eight silvers and one bronze. Kenny, Cundy and war veteran Byrne set a world record time of 49.809 in their mixed team sprint (C1-C5) race, beating China's Xiaofei Ji, Lu Zhang and Yuan Chao Zheng. That victory saw Kenny finish the competition as Britain's top performer with three gold medals, with Cundy winning two gold and one silver. There was drama in the tandem sprint as a decider was needed to separate Great Britain duo Fachie and MacLean from fellow squad members Anthony Kappes and Barney Storey. The two crews almost collided in the final race before Fachie and MacLean stormed ahead to add sprint gold to the tandem kilo gold they won on Saturday. Sarah Storey, who won Saturday's pursuit and is aiming to be the first Briton to represent her country at the Olympics and Paralympics, did not quite manage to beat Ju Fang Zhou's world record in her time trial final. But she did push Zhou of China into second place with a time of 37.733 seconds. The 33-year-old, who was born with a deformed left hand and won five Paralympic titles as a swimmer before switching to cycling, was clearly delighted with her hard-fought victory. Writing on Twitter, Storey declared: "Gold for me in the 500m. The world record-holder was leading when I got in the gate, so excited to beat her after five years of trying!" Lora Turnham and pilot Fiona Duncan posted the fastest tandem pursuit time in qualification but were beaten into second place in the final by the highly tipped New Zealand pairing of Jayne Parson and Sonia Waddell. Lead coach Chris Furber said the tournament results had given the team a boost and secured valuable qualification points towards places in the London 2012 Paralympics. He added: "The standard of the competition has really moved on since Beijing and being in a medal mix now means we are well placed for medal prospects in 2012."